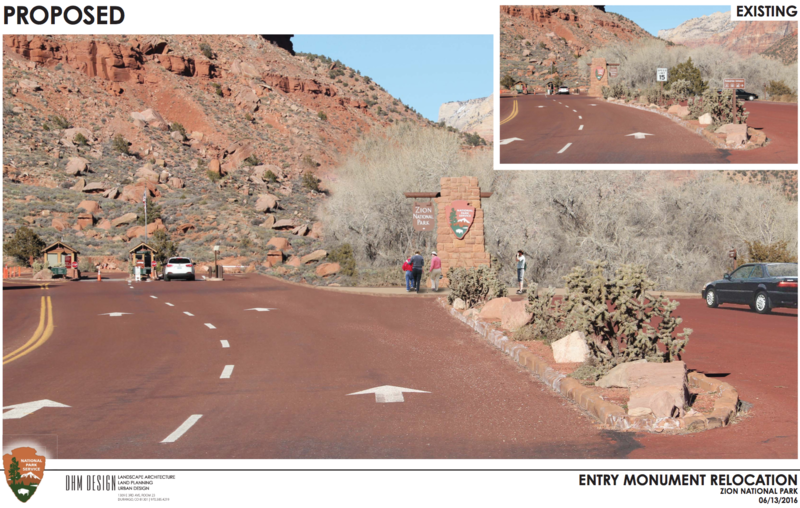 SPRINGDALE — The National Park Service announced Monday that it will begin accepting public comments on a plan to redesign the Zion National Park south entrance fee station. The objectives outlined in the environmental assessment are to decrease park entry wait times for vehicular traffic, reduce localized vehicle congestion, improve employee safety, develop a renewable energy source to sustain park operations and replace faulty culverts to improve roadway conditions during weather events. According to the environmental assessment now available for viewing, on the 10th-busiest day of 2016 the south entrance station had a demand of 324 vehicles per hour. The current fee station configuration only allows for approximately 194 vehicles per hour to be processed. This overburdening of the station can lead to traffic backing up as much as a quarter to half-mile into the town of Springdale, the report states. The environmental assessment goes on to state that an additional visitor entry lane would return a 50 percent increase in the number of vehicles that could be processed and would fully accommodate current park entry demands. The environmental assessment was prepared in accordance with the National Environmental Policy Act, which provides a decision-making framework that analyzes a reasonable range of alternative to meet project objectives, evaluates potential issues and impacts to the surrounding resources and identifies mitigation measures to lessen the degree or extent of these impacts. The South Entrance Fee Station Reconfiguration environmental assessment is available for public review from Aug. 20 through Sept. 3 on the NPS Planning, Environment & Public Comment (PEPC) website. A hard copy can also be obtained by contacting the Zion Environmental Protection Specialist by email at [email protected] or by phone at 435-772-0144. Following review of the environmental assessment, comments may be submitted before the close of the comment period online through the NPS PEPC website or through the mail to: ZION Superintendent, ATTN: South Entrance Fee Station Reconfiguration EA, Zion National Park, State Route 9, Springdale, UT 84767. If the US and UT State govt. would reduce all their advertising for foreign tourism the parks would not be so overcrowded. But why should they care, they are raking in the taxes while only the local residents have to bear the burden of clogged roads and inaccessible parks. UT residents cannot even visit their own lands while BLM & NPS restrict the best parts with hard to get permits and rake in big $’s for preventing most people from access. Well said. I absolutely agree.